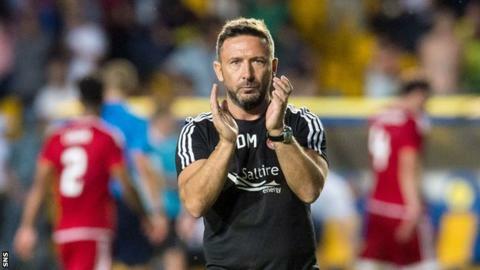 "Similar to the Croatian game [against Rejika], we didn't start with enough positive play," McInnes added. "In the second half everybody saw the Aberdeen team that I wanted to see from the first minute." At 3,415 miles, Aberdeen's trip was the longest distance travelled in a European club competition, and the Dons paid for a sluggish start as a low shot from Mikhail Bakaev and a stunning Bauyrzhan Islamkhan strike put the host in charge. "We weren't brave enough when we didn't have the ball and didn't impose ourselves in the game," said the Dons boss. "Unlike in Croatia, where, we probably didn't get punished for that opening 15-minute period, we did tonight with two bits of quality that we knew Kairat had. "In particular, the interchange of play for the first goal, we've dropped a runner there and that can always be punished at this level. "I've looked at the second goal again and it's almost 40 yards; a hell of a strike. I thought we were too deep as a team in that opening 20 minutes. "It was an uphill task from then and momentum was with Kairat at 2-0. They've got good confidence and I thought we showed good composure, good mentality and finished the first half strongly. "We were guilty of not taking more opportunities." Aberdeen host Kairat in the return leg of the play-off round next Thursday.